currently i am working with micro-satellite data from several local populations of Tanzanian elephants and i was wondering if there are somehow borders between my populations that prevent migration and therefore gene-flow. As elephants usually are animals that live quite long (if not killed by poaching right after reaching maturity), detecting actual barriers in field-observations might be difficult and requires a lot of effort. And that is where landscape genetic techniques come into the picture. 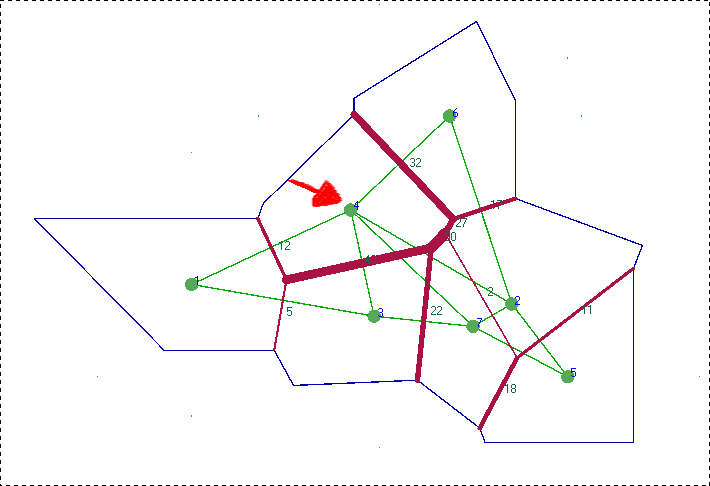 As early as in 1973, a french Guy called Monmonier (Monmonier 1973) came up with a very nice idea of barrier-detection using graph-theory and gis-techniques such as Vorronoi tessellations. Although previously intended to be used in a purely geographical context its nowadays has been extended and can be used in multiple cases including population genetics. I then bootstrapped my Microsatellite-data 100x times (Chao et al. 2008) and created pairwise-distance matrices using the D index introduced by Jost (Jost 2008). So i end up with a list of 100 “dist” objects in R.
I saved the list of dist-matrices into a txt-file and loaded it into Barrier to conduct a barrier significance test (Using replicates of the same matrix). Genetic Barrier detection using pairwise population differentiation indices with bootstrapped Microsatellite-data. As you can see especially Point 4 (red arrow -> a national park in central Tanzania) seems to be more genetically isolated than the other sampling locations (the strength of the red lines represent contribution of the bootstrapped barriers). However the whole result was a bit disappointing for me (no really clear barrier) and additional analysis using the popular program structure as well as traditional population differentiation indices like Fst, G’st and Jost’D revealed that the population structure of elephants is indeed quite complex. Still i really like this technique and I’m curious about other use-cases. Monmonier, M. (1973) Maximum-difference barriers: an alternative numerical regionalization method. Geographic Analysis, 3, 245–261. Manni,F., Guérard, E. & Heyer, E. (2004). Geographic patterns of (genetic, morphologic, linguistic) variation: how barriers can be detected by “Monmonier’s algorithm”. Human Biology, 76(2): 173-190. Jost, L. (2008), GST and its relatives do not measure differentiation. Molecular Ecology, 17: 4015-4026. Get credit for your work!